The ceiling of a small shoe factory outside the Cambodian capital of Phnom Penh collapsed early Thursday, killing at least two workers and injuring seven as a result of the falling concrete. The latest accident, which comes less than a month the deadliest industrial disaster in Bangladesh killed more than 1,120 people, underscores the deadly safety conditions many garment workers face in the developing world. About 50 workers were inside a workroom of the factory when the cave in occurred. 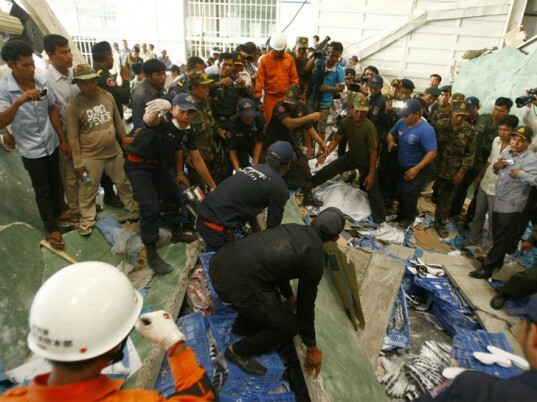 Ken Loo, the secretary general of the Garment Manufacturers Association in Cambodia, told the New York Times that steel beams holding up a concrete-floored storage area on a mezzanine above appeared to have been responsible. Loo said that the factory, which is owned by Wing Star Shoes in Taiwan, had been making athletic footwear for Asics at the time of the incident. Naomichi Hatori, a spokesman for Asics in Japan, said Asics “offered its deepest sympathies” to the victims and their families, and that the company would review safety regulations at its overseas suppliers. The accident shows that the issue of worker safety is not only isolated to Bangladesh. 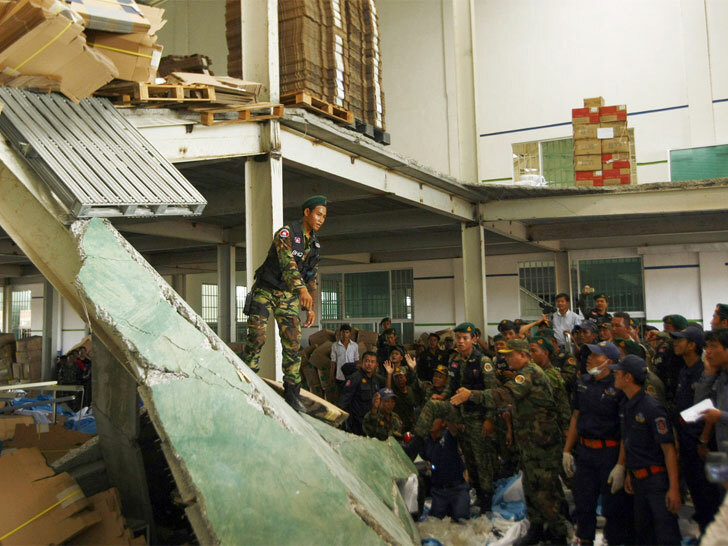 An initial investigation showed the collapsed ceiling was poorly built and lacked the structural stability to support heavy weight, said Ou Sam Oun, governor of Kampong Speu province, where the factory is located. Clearly the issue of worker safety is “not only isolated to Bangladesh, and that companies [elsewhere] are trying to drive prices down by taking shortcuts on workers’ safety,” Phil Robertson, deputy director of Human Rights Watch’s Asia Division, told the Associated Press. As in Bangladesh, the garment industry is Cambodia’s biggest export earner, employing about 500,000 people in more than 500 garment and shoe factories. In 2012, the Southeast Asian country shipped over $4 billion worth of products to North America and Europe. Although Cambodian workers have some of the lowest wages in Asia, their average of $120 a month in salary and benefits far outstrips the $37 earned by their Bangladeshi counterparts. That’s not to say what happened in Bangladesh couldn’t occur in Cambodia, however. A recent report by the International Labour Organization’s “Better Factories Cambodia” program called for “urgent attention” to worker safety in the country’s garment and footwear industry after it found a “worrying increase” in fire-safety violations.